Friends who are interested in improving their knowledge of orchard maintenance in order to help maintain the community orchards on the Loop may be interested in enrolling in training taking place on Saturday 6th February in Old Trafford. Details have been posted on the Friends’ Facebook page and can be found here, or those interested can contact dan@theurbanorchardproject.org. At dusk on Old Tweflth Night, Sunday 17th January 2016, a hardy band turned out to celebrate our annual wassail of the community orchard at the Quadrants, Levenshulme (Crayfield Road). This was a postponed and scaled-down version of the originally planned event (due to very heavy rain on the initial date of Sunday 3rd January), but nevertheless there was mulled cider, home-made apple cake, a procession round the orchard fixing cider-soaked toast (lucky birds) and ribbons to the fruit trees, and a firework finale! With added cheery involvement from several passers-by, we hope to have set the orchard fair for continued flourishing through 2016! An orchard wassail to welcome 2015! Gather around 4 p.m., i.e. dusk fall, and the first songs will be sung half an hour later, and hopefully there will be enough of us to conjure up a Wassail Queen to lead us through the orchard of not only apple, but pear, plum, damson and greengage trees, and wish them health – wassail – through this season of winter, and into the following year. There will be singing – bring a drink to warm you up and whet your whistle, maybe some food to share. It doesn’t last long – maybe an hour altogether, but enough for magic to happen and cheer the cockles of the heart as we enter a new year! We are wassailing the Levenshulme community fruit orchard again in 2014! The wassail will be held from 4pm on Sunday 5th January; for more details please see our Events page. Nominated for the North West Empowerment Awards! 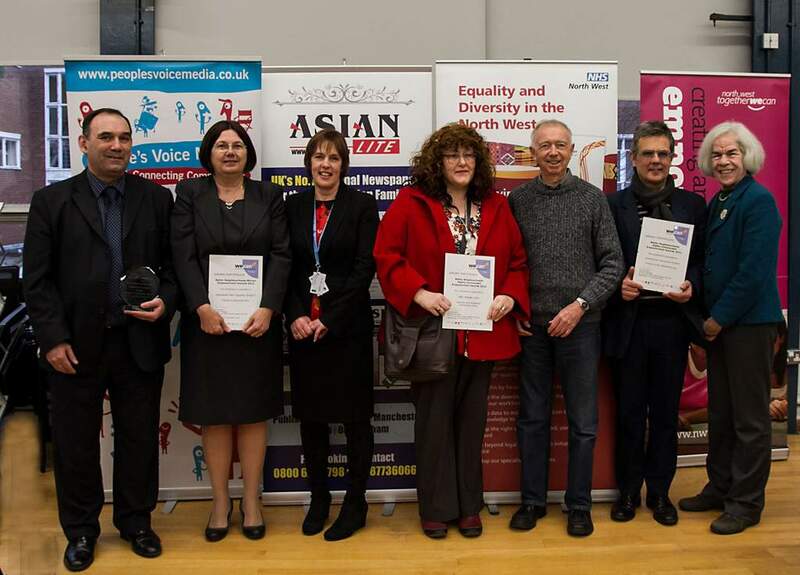 On Wednesday 12th December 2012 several of the Friends attended the North West Empowerment Awards ceremony. These awards were open to community or voluntary groups that have delivered a project regarded as having made a positive difference in their community. The Friends had been one of four shortlisted from 33 applicants in the “Better neighbourhoods” category, and although we did not win the prize we received a “highly commended” plaque for working with the Levenshulme groups on the community orchard!